HAN Automotive Research (HAN-AR) is a research partner for the professional domain. We offer companies and organizations a broad spectrum of research services around the themes ‘INTELLIGENT MOBILITY’ and ‘GREEN MOBILITY’. ‘INTELLIGENT MOBILITY’ is completely about smart vehicles: Technology that ensures safer, more comfortable and more efficient transport. The Dutch economy, as well as other countries, require modern technological solutions to reduce congestion problems and, at the same time, improve traffic safety by reducing injuries and fatalities. Smart vehicles make use of high-tech intelligent systems to assist the drivers for vehicle control that help in preventing accidents. Themes such as ‘Advanced driver support’, ‘Autonomous vehicles’, ‘Cooperative vehicles’ corresponds to the objectives of ‘INTELLIGENT MOBILITY’. ‘GREEN MOBILITY’ focusses on the development of new and improved powertrain systems for vehicles. Sustainability is thereby the most important theme for the near future, with an emphasis on reducing fuel consumption and emission of harmful gases. Our research programmes such as ‘Electrification of the powertrain’, ‘Optimising fuels, engines and emissions’ and ‘Lightweight automotive design’ complement those of the future powertrains. 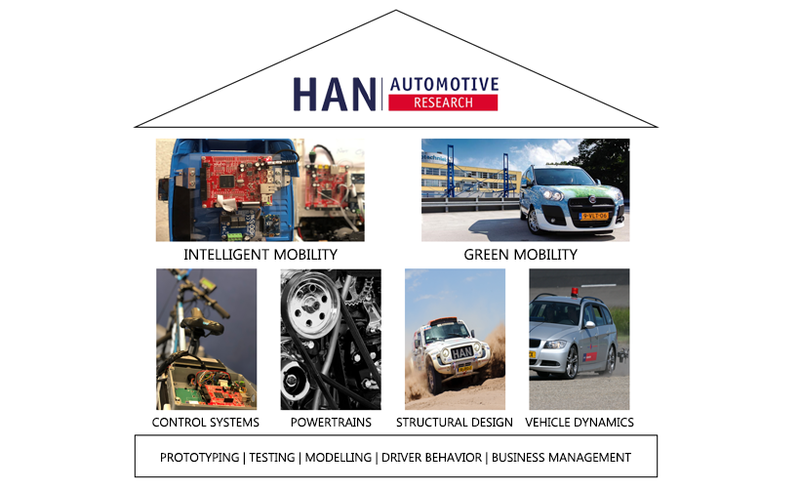 HAN-AR has expertise in several domains such as Prototyping, Modelling, Testing, Control Systems, Structural Design, Driver Behavior and Monitoring that perfectly compliments our research themes ‘INTELLIGENT MOBILITY’ and ‘GREEN MOBILITY’. Our activities are tailor made with respect to the specific needs of the customer and we respond flexibly to specific requirements, explore our expertise to understand how we could assist you with our competencies. Innovative learning with professionals and students! HAN Automotive Research works with skilled professionals and external experts. In addition, HAN Automotive Research offers clients an opportunity to execute their research questions through students in the different phases of innovation. The student often visualizes research questions in a different way resulting in new insights. By diving intensively into the subject, a problem is tackled broadly and results in "Innovative learning" for the companies as well as the students. Explore our expertise to know more about the services we offer!